It's the middle of March and I've not posted in awhile. I had an accident up on Mt. Ord in February where I slid on a muddy, ash-filled slope and landed on my camera lens and broke it. I sent it out and $500 later it was repaired and looks to be as good as new. I finally had a chance to get out with the repaired lens and do some birding. I actually did not know where I was going to go. According to my Birdseye App, all of the birds in my area are already on my list. I never meant to be a lister, but because I tend to move around often, I really like to build my life list. Most of the ones that I need in Arizona are outside of Phoenix and I need more than a morning to go after them. But, there were still some. I've been trying to see Mountain Plover in the Santa Cruz Flats all winter. It's just at the end of their snowbird season, but I thought that I would try one more time for them. There was also a chance of seeing a Ruddy Ground Dove in the area too, so it was worth a trip if I could get either one of those. 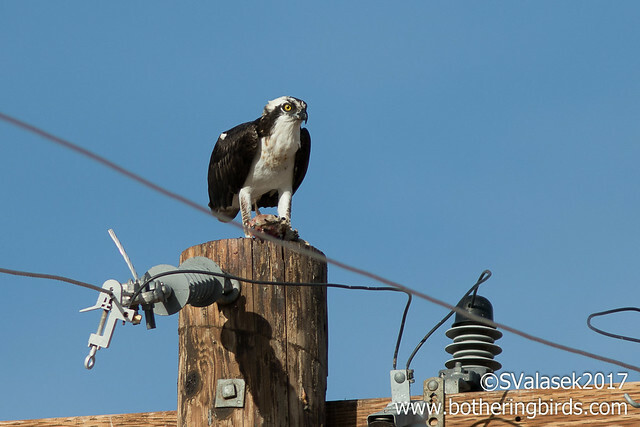 I got a late start on the day, but one of the first birds that I saw was an Osprey just out of my hometown of Gilbert on the Gila River Native American lands enjoying a fish's head. 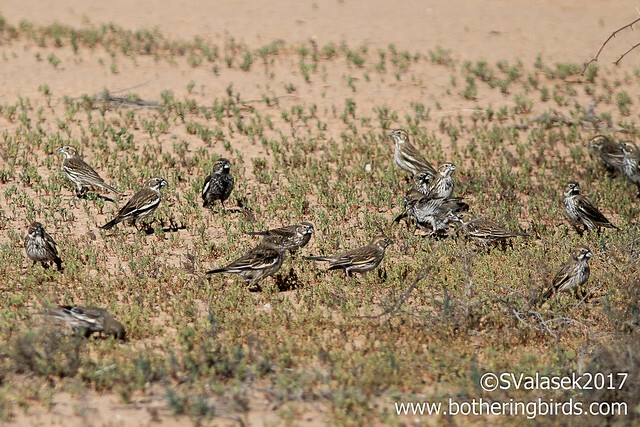 After arriving in the north part of the Santa Cruz Flats I was greeted by a large flocks of Lark Buntings. These guys were gathering together to make their trip north in the coming weeks. One of them was even getting into it's breeding plumage. 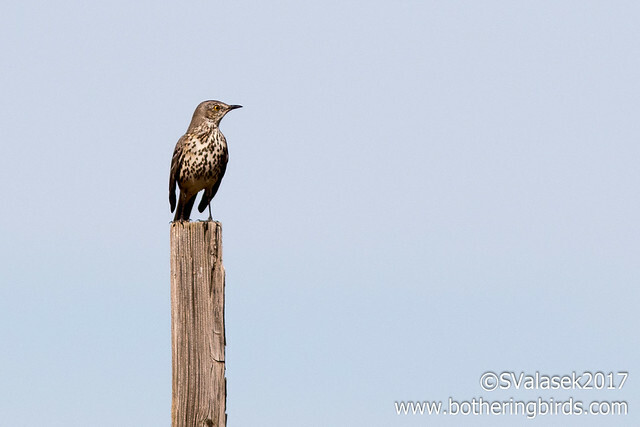 Just before the turn-off East towards the Evergreen Sod Farms I noticed a speckled bird fly across the road and land on a fence post, so I pulled over and went to get a better look. 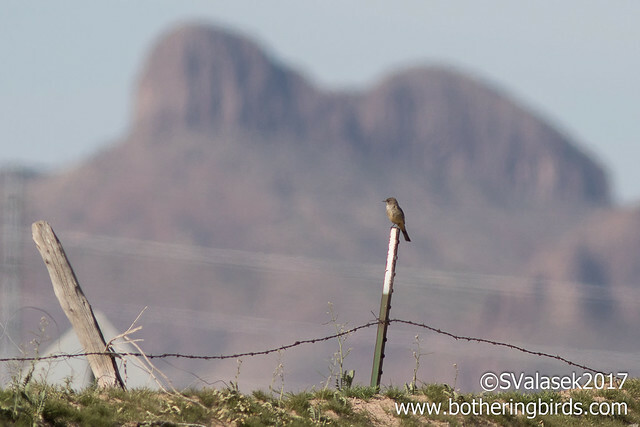 It was a surprise Sage Thrasher, also on it's way north. It was shortly joined by a second one and together they did some foraging along the roadside. I noticed a large, tan building behind me that had some birds flying around. I recognized some House Sparrows and a Say's Phoebe. The building was clearly empty with no windows or doors and a large for-sale sign out front and no fence, so I decided to take a peek inside on a hunch. I looked up into the rafters and saw someone looking back at me. 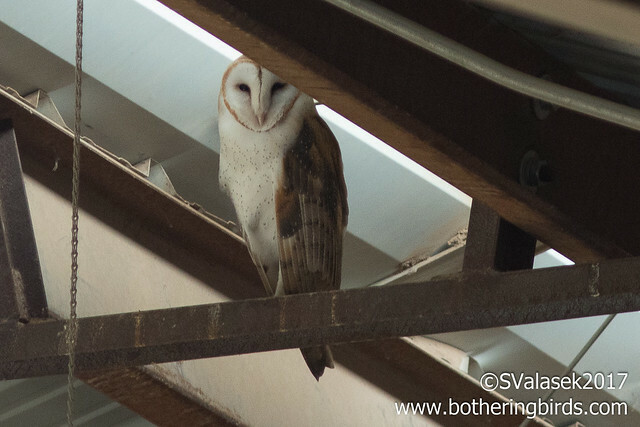 It was a Barn Owl! I've been trying to see one for years. 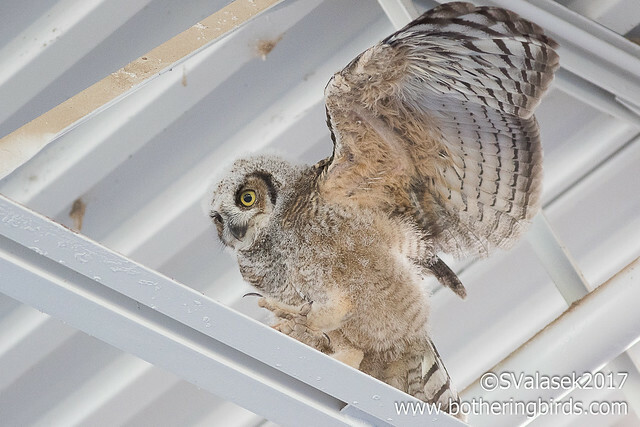 I had a glimpse of one near Bosque Del Apache in New Mexico 5 or 6 years ago, but just as it flew out of a nest box and off into some trees. I couldn't believe it. 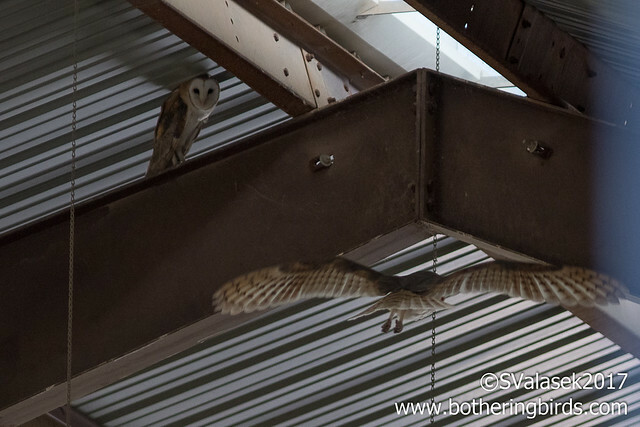 And just then, it got even better, a second one flew next to the first. 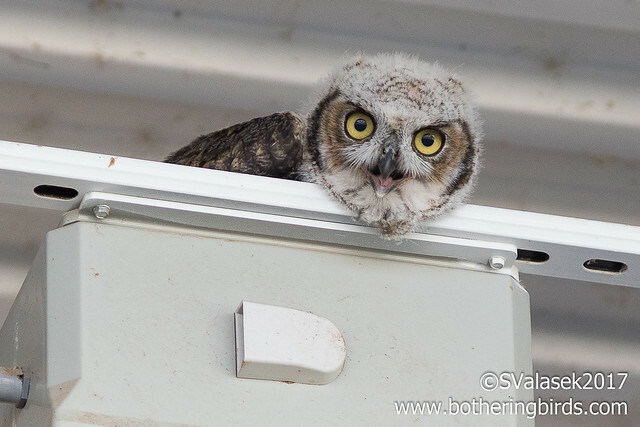 The owls ended up being the highlight of my day since I once again dipped on Mountain Plovers and Ruddy Ground Dove. But there is always next winter. 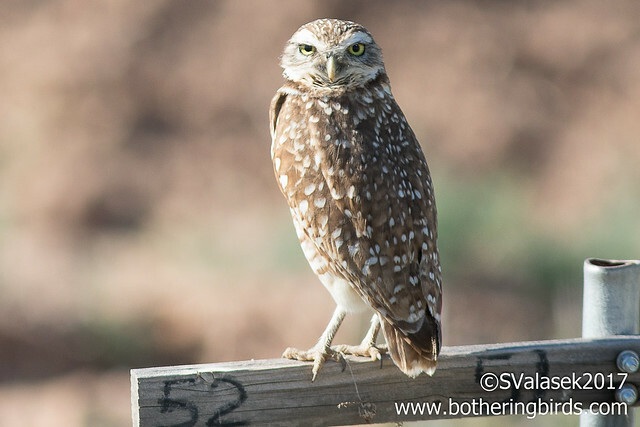 The following day, Monday, I had a few minutes free and decided to check in on some other owls, there are Burrowing Owls which are year-round residents in a park near my house in Gilbert. They live in artificial burrows made from PVC pipes which are just along a concrete footpath and fairly used to people. I also wanted to ditch my teleconverter because I haven't been very happy with the quality of my photos and read that the aren't the greatest for shorter-focal length lenses (I just have a 300mm). 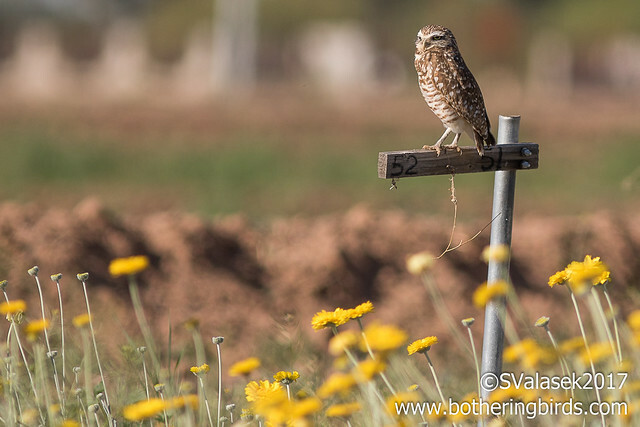 I saw two Burrowing Owls in the few minutes that I had and along with some blooming wildflowers were very nice to see. My kids have just started 2 weeks of spring break. 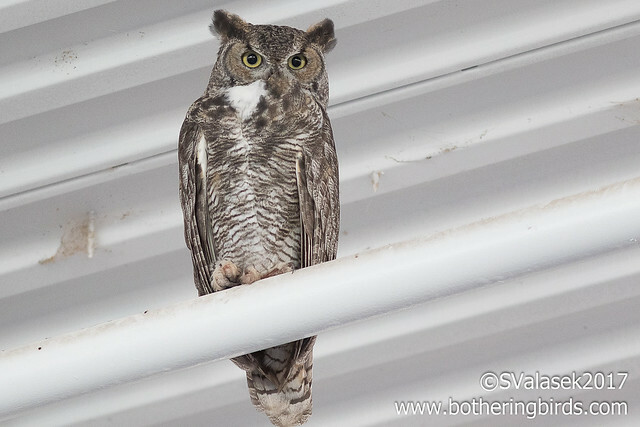 We had a Monday afternoon free and I wanted to show them some Great Horned Owls. I knew of a nest in Scottsdale, but not the exact location. Plus it is already hot here in Arizona. It's mid-March and already over 90°F, too hot for a hike if we didn't need one. 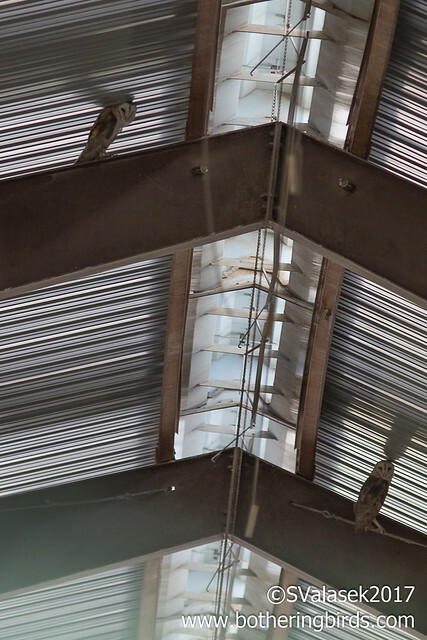 But I also knew of another nest of GHOW at a Lowe's Home Improvement store, also in Gilbert. So we made a quick stop there and were rewarded with seeing three of them in the lawn and garden section. The single young bird there was looking older than I was expecting, with many adult feathers poking out of it's baby-down and getting it's wings ready to fly. Both parents were nearby watching everyone too. I my kids loved seeing them. I got to show them some pellets on the ground below them we got to see some tiny bones. My parents flew in to visit us and I took my mom by today to see them too (and to get some keys made). 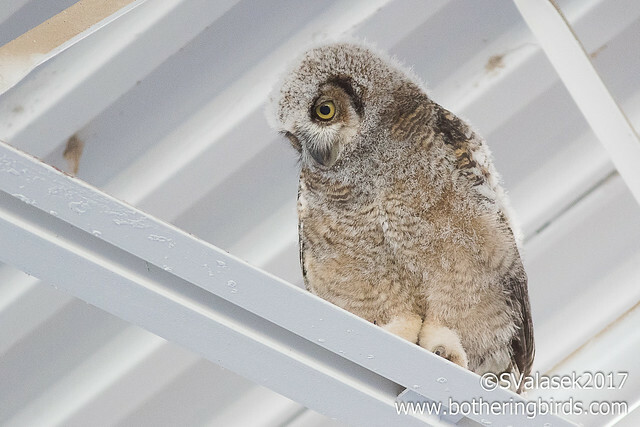 What a great urban birding experience. 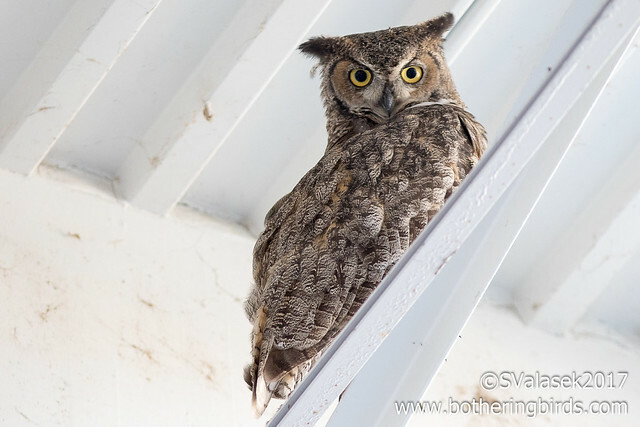 Hopefully my owl-luck continues and I get to see some Elf Owls this spring, they are just now arriving back to Arizona.